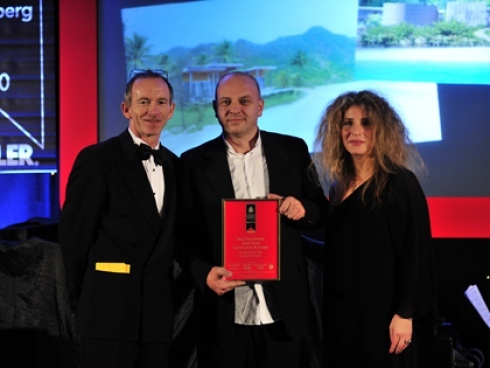 VNRE – VinaLiving, Vietnam’s leading real estate brand, today announces that its Ocean Villas luxury residential villas project, a component of the 260-hectare Danang Beach Resort, was awarded two prizes as part of the 2011 Asia Pacific Property Awards in association with Bloomberg Television. The Ocean Villas is an enclave of 115 free-standing homes on a 21-hectare parcel of beachfront land near Danang, Vietnam. The homes are on lots that average 700 square metres, each with a private swimming pool. The Ocean Villas are part of the 260-hectare Danang Beach Resort, which features the 18-hole Dunes Golf Course, designed by golf legend Greg Norman. The ‘Best Marketing’ award reflects the launch of the VinaLiving residential brand, Vietnam’s first lifestyle and tailored living brand. The Ocean Villas was the first VinaLiving project to reach the market, with very rapid acceptance and take-up from 100-percent domestic Vietnamese buyers. The ‘Best Golf Development’ award recognised the Ocean Villas unique aspects as an integrated beachfront/golf course development. The master planning accentuates this integration, in both form and function. All the Ocean Villas homes have ocean and/or golf course views, and are connected by waterways that wind through the community, and the fairways of the golf course. The built environment follows the form and context of the natural surroundings, and there is easy access by foot or vehicle to the other components of the resort. The presentation of 2011 Asia Pacific Property Awards will be held in Shanghai on 30-31 May 2011 at The Longemont Hotel in Shanghai. The presentation dinner is part of a two-day Property Summit event that will be attended by hundreds of leading property professionals from across Asia Pacific. A record number of 21 different countries took part in the 2011 Asia Pacific Property Awards. These awards are part of the International Property Awards which was established 17 years ago and cover residential as well as commercial categories. Later this year, top scoring winners from the Asia Pacific Property Awards will compete against other winning companies from Europe, Africa, the Americas and Arabia to find the World’s best in each category. Sales of the Ocean Villas residences are almost complete, with ongoing sales at the Danang Beach Resort including two more villa enclaves, Norman Estates and Dunes Residences, and one condominium project, the Cham. 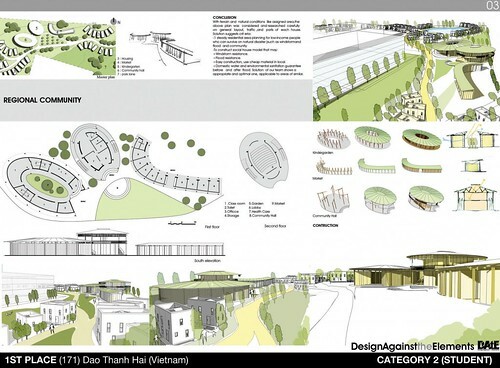 – Dang Ngoc Anh, class 07K3 – Hanoi Architectural University. 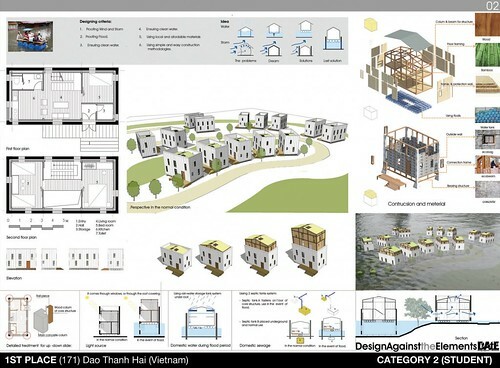 – Nguyen Ha Thang, fourth-year students – Phuong Dong University. 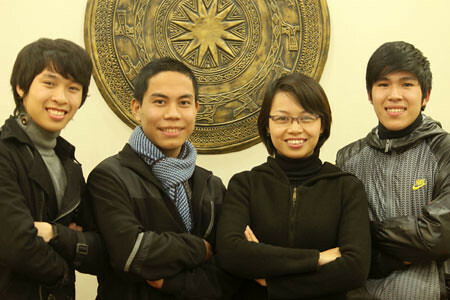 – Tutor: Ms. Nguyen Hanh Nguyen, PhD, Architect, lecturer of Hanoi Architectural University. The plan for “self-supporting disaster village” is a residential for low-income people, can confront natural disasters such as storms and floods. 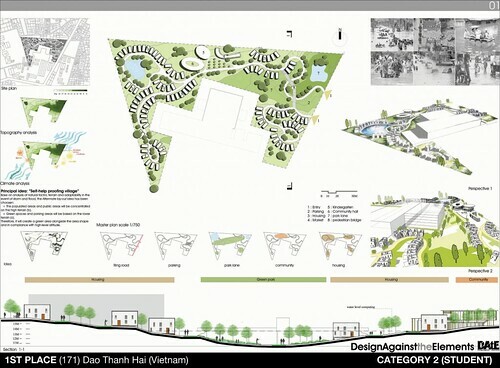 Village planning based on land topography has created two “natural island” in order to minimizes the impact of flood, the group of homes can help each other when natural disasters happen. The idea about a home as a piston with two structure layers: the cover layer to prevent storm – the core layer to float upon the flood. The village is a model that could apply to many similar areas. DATE – Design Against the Elements is a global architectural design competition meant to find a solution to the problems presented by climate change. The competition calls for people working in architecture, urban planning contribute to develop sustainable home against natural disasters for communities in the tropic urbans. Born in 1976, DATE – Design Against the Elements is held yearly. In 2010, the competition was launched from 05-March and has attracted 400 entries from all continents. VNRE – The freshly-opened Six Senses Con Dao resort in Con Dao Island off southern Vietnam has won the coveted award of Best International Small Hotel Construction and Design. The prize, part of the International Commercial Property Awards held in association with Bloomberg, was presented at a gala banquet in London. Developed by Indochina Land and owned by Thailand-based Six Senses Resorts & Spas, the US$34 million resort offers 50 villas along a mile of sandy beach, sheltered by green forested hills. The award is in time as the resort was just opened on December 20. “The Six Senses team has been proud to work with Indochina Land in the development of Six Senses Con Dao and that our collaboration has already achieved such an accolade, is a wonderful measure of a happy partnership,” said Sonu Shivdasani, Chairman and CEO of Six Senses Resorts & Spas. This year’s judges for the International Commercial Property Awards include Luke McKend, industry head property markets of Google UK; Peter Bolton King, group chief executive of the National Federation of Property Professionals; and Christopher Hall, president elect of FIABCI. Other judges are Fiona Nixon, chairman of the Australia Institute of Architects, Hendrik Nelde, president of FIABCI Belgium; Helen Shield, editor-in-chief of International Homes Luxury Collection magazine and Sven Johns, CEO of the German Real Estate Association. Part of the resort is designed to resemble a traditional Vietnamese village. Con Dao is part of a 16 island archipelago, most of which is protected as a national and marine park, sheltering and protecting many endangered species. The International Property Awards cover both residential and commercial categories.